THE Right2Water movement has announced a “One Last Push” rally for Dublin City Centre on Saturday 8 April. Final details will be announced shortly, Right2Water Co-ordinator Brendan Ogle said, after consideration of the best location in the midst of major roadworks for new LUAS lines. April’s “One Last Push” will be a family-friendly event in one central location with feeder parades from Heuston and Connolly rail stations. Based on experience, tens of thousands of people from across the country are expected to attend. Right2Water Co-ordinator Brendan Ogle was joined by Sinn Féin TD Jonathan O’Brien from the Joint Oireachtas Committee on Water, and Maeve Curtis, a community activist from Dundalk. The three represented the three pillars of the Right2Water campaign: trade union, political and community. There was a number of Independent and AAA/PBP TDs in the audience to show their support. 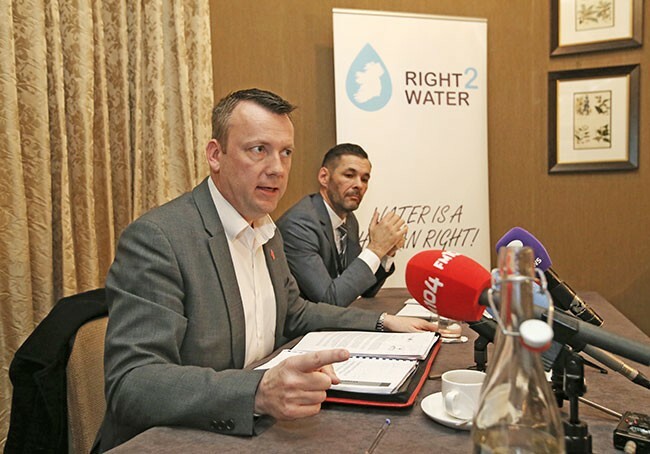 Brendan Ogle said the movement has come a long way since the threats issued by the Fine Gael Government to cut off householders’ water or garnish water resisters’ social welfare payments or wages. 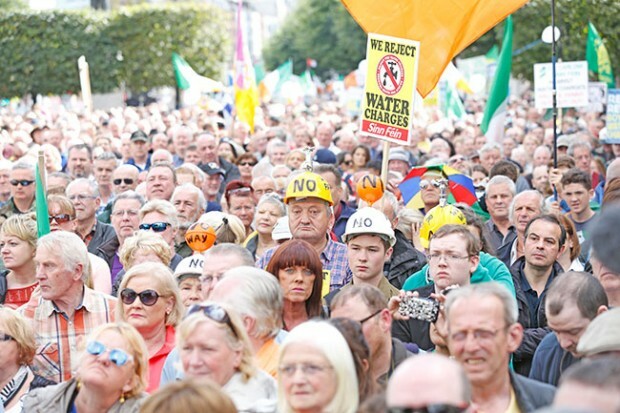 Now Right2Water feels it is necessary “to bring its voice back into the arena, for the public to have their say”. It’s time for the Dáil to “carry out its democratic mandate” to force one and for the end of water charges and to block “commodification” and the privatisation of water in Ireland, Brendan Ogle said. “Without the sustained pressure exerted by the public through the Right2Water campaign since 2014, we would not be where we are now with charges nearly abolished and an Oireachtas Committee largely reflecting the views of hundreds of thousands of people who came on to the streets of our towns and cities to assert our human right to water, as well as the electorate in election 2016. “We welcome the unanimous view of the Oireachtas Committee that a referendum should be held to enshrine our water services in public ownership. Sinn Féin TD Jonathan O’Brien said the Joint Oireachtas Committee could have published its report on schedule in early March. Fine Gael and Fianna Fáil TDs, however, got together to outvote TDs supporting Right2Water and unnecessarily moved to extend the deadline by another four weeks to 14 April for more legal opinion to be sought. “We’ve already had five different sets of legal opinion. Nothing is going to change the facts. There is no reason why we couldn’t have finalised the report this week,” the Cork City TD said.